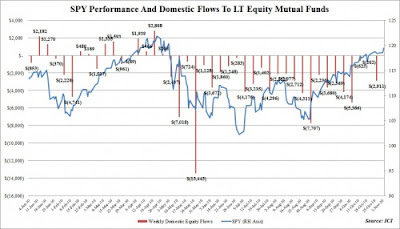 Washington, DC, November 3, 2010 - Total estimated inflows to long-term mutual funds were $3.32 billion for the week ended Wednesday, October 27, the Investment Company Institute reported today. Flow estimates are derived from data collected covering more than 95 percent of industry assets and are adjusted to represent industry totals. Equity funds had estimated outflows of $2.34 billion for the week, compared to estimated inflows of $2.07 billion in the previous week. 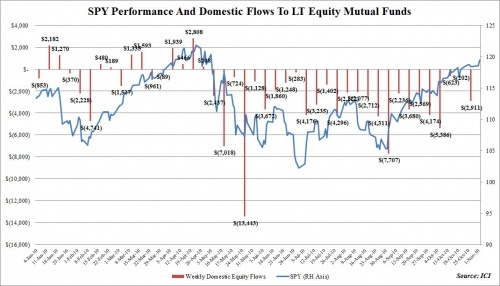 Domestic equity funds had estimated outflows of $2.91 billion, while estimated inflows to foreign equity funds were $569 million. 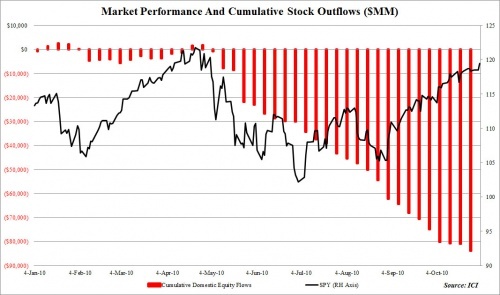 Since April 30th, 2010, $77.042 BILLION has been withdrawn from Domestic Equity Funds (This is the 26th sequential weekly outflow from US stocks).